Knowing what to do to protect your rights after an auto accident can be difficult. One of your first steps involves understanding your New York State Department of Motor Vehicles Police Accident Report. This report can dramatically affect how much money you receive for your accident. Insurance companies scrutinize every single word. You should, too. It's important to understand what all the codes, symbols and abbreviations mean on your report. To help you, we have included below a sample accident report with comments. If you need help interpreting your report, contact the Law Offices of James Morris for a free consultation. Our firm has successfully obtained millions of dollars for injury victims in New York State. Call (800) 477-9044. 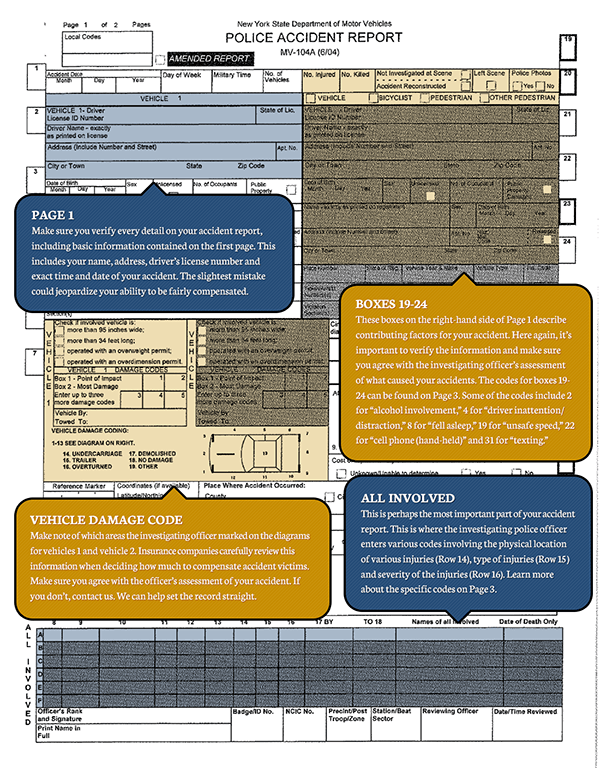 Make sure you verify every detail on your accident report, including basic information contained on the first page. This includes your name, address, driver's license number and exact time and date of your accident. The slightest mistake could jeopardize your ability to be fairly compensated. Make note of which areas the investigating officer marked on the diagrams for vehicles 1 and vehicle 2. Insurance companies carefully review this information when deciding how much to compensate accident victims. Make sure you agree with the officer's assessment of your accident. If you don't, contact us. We can help set the record straight. This is perhaps the most important part of your accident report. This is where the investigating police officer enters various codes involving the physical location of various injuries (Row 14), type of injuries (Row 15) and severity of the injuries (Row 16). Learn more about the specific codes on Page 2. These boxes on the right-hand side of Page 1 describe contributing factors for your accident. Here again, it's important to verify the information and make sure you agree with the investigating officer's assessment of what caused your accidents. The codes for boxes 19-24 can be found on Page 2. Some of the codes include 2 for "alcohol involvement," 4 for "driver inattention/distraction," 8 for "fell asleep," 19 for "unsafe speed," 22 for "cell phone (hand-held)" and 31 for "texting." Many of the codes for Page 1 can be found here. This page can be difficult to understand due to all the arrows and boxes on the page. Feel free to contact us if there's any confusion or doubt about what certain codes mean on Page 1 of your accident report. Much of this page concerns the codes for various types of injuries marked in Column 15 on Page 1 in the section named "Types of Physical Complaint." The codes cover mild to severe injuries. If you believe you have a serious injury and the officer described your injury as minor, contact us immediately. We can work with you to provide supporting evidence of the severity of your injury. Each hospital in New York State has specific 4-digit numeric code. The codes for every hospital in the state outside New York City can be found on this page. Verify that the code here matches the code entered in Boxes 17 and 18 on Page 1. If you or a loved sustained an injury that required either of you to be hospitalized, this is a very serious matter. This page concerns accidents involving commercial trucks or buses. Commercial trucks can include delivery trucks, 18-wheeler, semi-trucks and tanker trucks. New York State has specific codes for different types of trucks. Those codes can be found here and on Page 1 of your accident form in the box marked "Vehicle Type" in the same row that starts with the "Plate Number" box. Accidents involving commercial trucks can be complicated because injury victims must deal with many different companies - trucking companies, insurance companies and the teams of lawyers that often work with them. If you have been injured in an accident and need an attorney to discuss your accident report and case with, contact the Law Offices of James Morris. We'll pore over the evidence for your accident and build a strong, legal case. We're here to help you get the compensation you need and the justice you deserve.